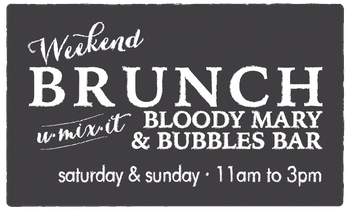 Join us for a special treat on Saturdays and Sundays when you become the Master Mixer of your Mary or Mimosa. BLOODY MARY BAR: You pick the vodka, we’ll give you a glass, and you take it from there. Choose from a selection of mixes and condiments ranging from Applewood Smoked Bacon, Celery, Jalapeños, Stuffed Olives, House-Pickled Veggies, Hot Sauces and Spices. Step on up to the Bloody Mary Bar to mix up your perfect Mary with $5 Titos! BUBBLES BAR: Get bubbly over our new Bubbles Bar and create your perfect mimosa with a selection of fresh Juices and Fruit Garnishes. Only $4 and perfectly paired with Weekend Brunch!